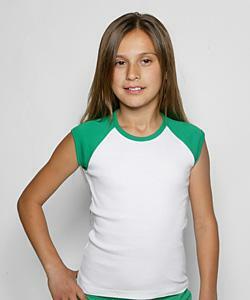 t-shirt with contrasting neck and sleeve band. Features crew neck and cap sleeves." 1x1 Fine Rib, Ring-Spun Cotton (5.8 ounces per square yard). 5/8-inch binding on neck. Two-needle stitching on sleeves and bottom hem. "Vintage sheer t-shirt features long body, set in collar, crew neck and cap sleeves. 3.2 oz. 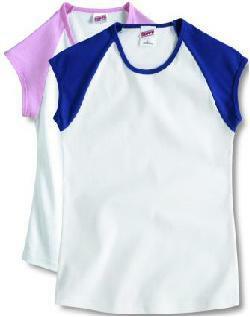 preshrunk sheer jersey 100% combed ring spun cotton." body, crew neck, cap sleeves and set in collar." sleeves and set in collar." 5.5 ounce pre-shrunk ring-spun cotton. Cap sleeves. 1/2" ribbed collar with shoulder to shoulder taping. Double needle stitching on neck, sleeve and bottom hem. crew neck, cap sleeves and set in collar." 1x1 Fine Rib, Ring-Spun Cotton (5.8 ounces per square yard). Contrast stitching along neck, armhole, side and bottom hem. 5/8-inch contrast stitching along neck and reverse two-needle stitching on bottom and side hems. 95/5 Ring-Spun Cotton Spandex (6.0 ounces per square yard). New and improved fit. Capped sleeves, two-needle narrow gauge cover stitching. 5/8-inch binding around neck. -Pre-shrunk semi-sheer 4.2 oz. 100% combed ring spun cotton jersey. -Contrast blanket stitch on sleeves and bottom hem. -Cap sleeves, fitted silhouette and side-seamed. -Pre-shrunk 100% cotton 50 single combed ring-spun 4.0 ounce. -Super soft sheer mini rib knit. 3/8" binding at neck and sleeve. -Coverstitched 1 1/4" bottom hem. 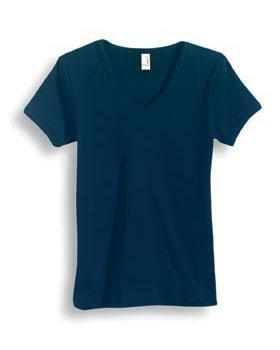 -Deep v-neck and cap sleeves with slim fit. 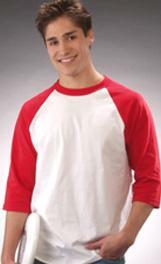 6 oz., 100% cotton fine rib, double needle hem, cap sleeves, contoured for superior fit, longer length. 92% polyester/8% spandex knit jersey peached for softness. Mesh side pocket with invisible YKK zip closure at wearer's left. Mesh inset at shoulder for breathability. Contrast coverstitch at shoulder, pocket and bottom hem. Side vents for extra mobility.